Three dozen students and faculty members from NMC’s undergraduate nursing (BSN) and graduate occupational therapy (MOT) programs provided health screenings, assessments and education to protect foot health and prevent small issues from developing into chronic health problems, such as the loss of a foot or limb to untreated diabetes or frostbite. Pictured in top photo: Master of Occupational Therapy students Jami Neckoliczak and Katelyn Leming. Below: Nursing student Ben Troudt. 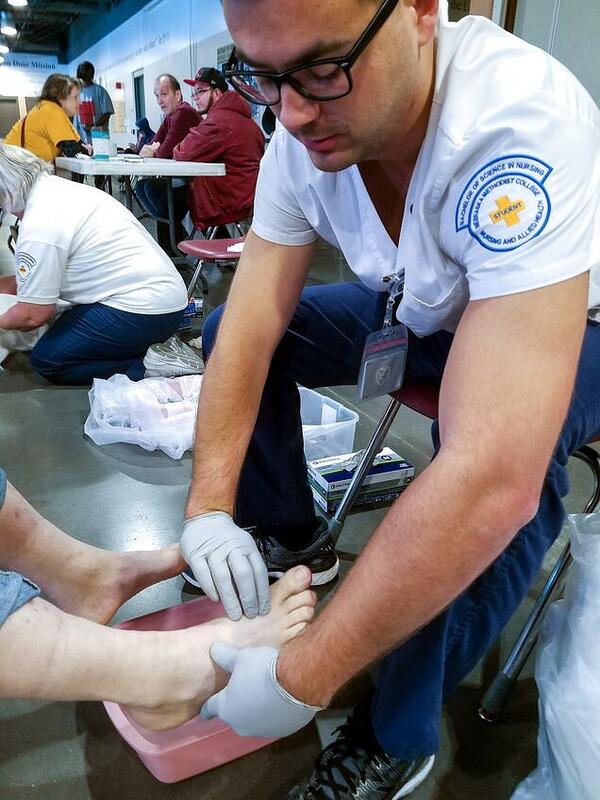 More than 100 homeless adults received free nursing and occupational therapy services, including foot baths, diabetes and vision screenings, gate and fall risk assessments, mobility equipment from the NMC occupational therapy equipment closet, minor equipment repairs, referrals and boot fittings. 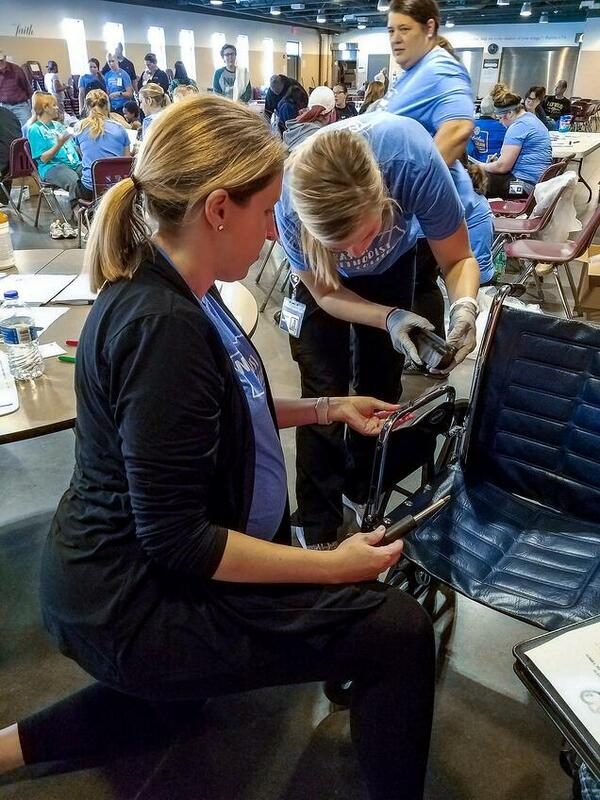 Below: MOT Program Director Melissa Kimmerling, EdD, OTR/L, and student Erin Shuck make wheelchair adjustments. 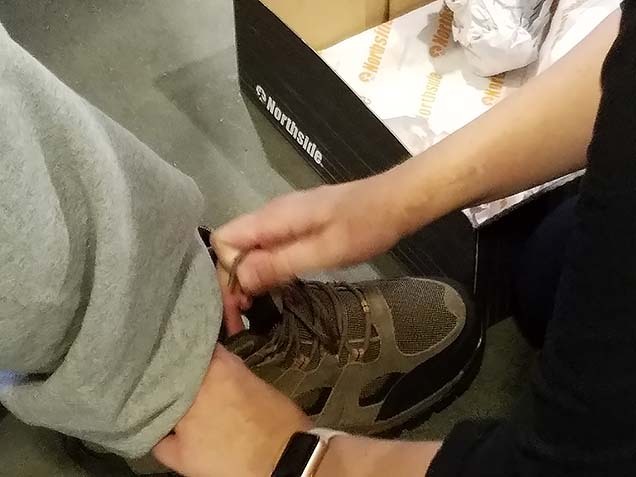 In addition, new hiking boots, socks and foot care kits were made available to the homeless through grant funding from Suburban Rotary of Omaha, with boots provided at cost by Scheels. More than 40 Rotarians volunteered on site, helping to make the event a success. 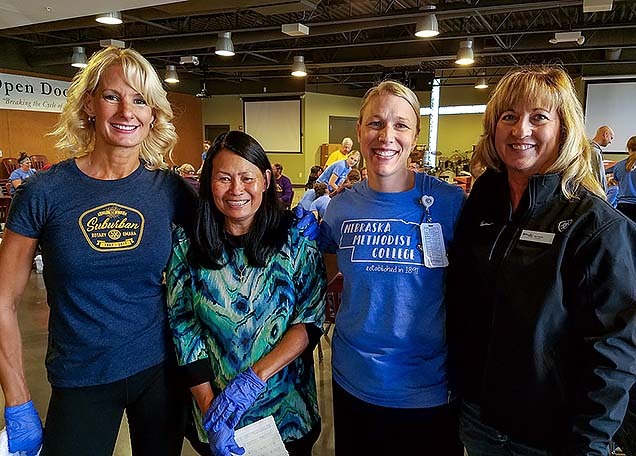 “There is so much power to impact health in partnerships like this,” said Jillian Sisson, DNP, RN, NMC's dean of professional development and community partnerships. "It's by connecting with others and leveraging our assets that we can make a really substantial difference in our community." 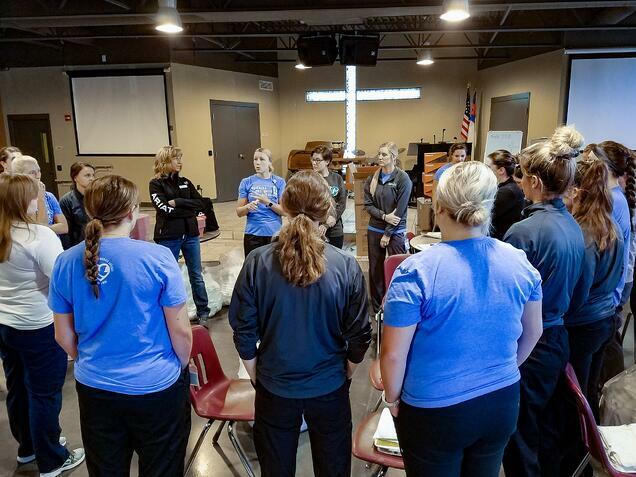 Below: Dr. Jillian Sisson (in blue T-shirt, facing camera) instructs the NMC team. NMC is involved in more than 100 active community partnerships. 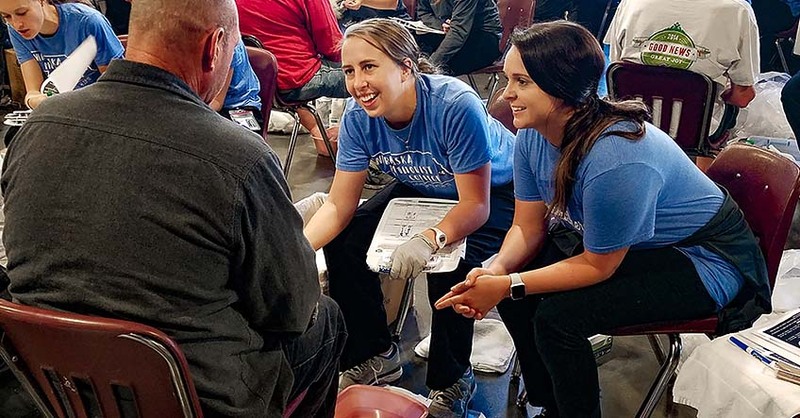 Some, like the Foot Care Clinic for the Homeless, combine community-based clinical education with interdisciplinary collaboration to maximize the benefits to the individuals and the community served as well as the students delivering care. Below: Nursing student Lisa Kessler. This is the second year for the event, held in partnership with NMC and its Mobile Diabetes Center (pictured below). The desire to make a difference—and to act with respect, dignity and humanity—is at the heart of this event. Hollenbeck explains that one day her friend Jenny Johnson encountered four hungry homeless men at the downtown public library. Johnson left to buy food for them, returning with four sandwiches. Every Wednesday since, rain or shine, she has cooked a hot meal to feed the homeless. Every Wednesday morning, with the help of friends like Hollenbeck who volunteer, she feeds 100 or more individuals at 14th and Farnam. Hollenbeck was on the street corner helping with the meal one bitterly cold winter morning when she happened to glance down and notice the feet of the people being served. What she saw both saddened and inspired her. The idea for the Foot Care Clinic was born. Below: Holly Hollenbeck, Jenny Johnson, Jillian Sisson, Deb Carlson. 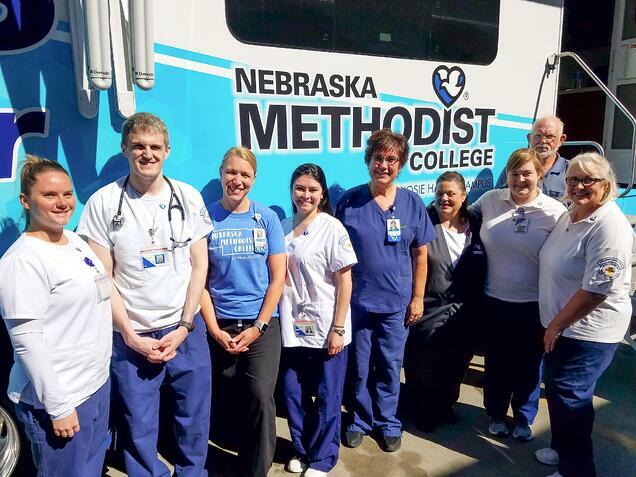 “Partnerships and events like these are an essential part of the NMC experience,” said Dr. Deb Carlson, president/CEO of Nebraska Methodist College. 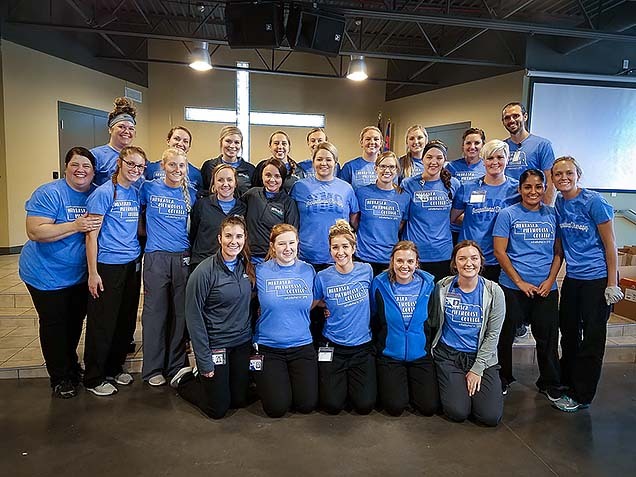 “We're living our mission out in the community by serving others and by helping our students develop not just the skillset, but the mindset and heartset to be outstanding healthcare professionals." Below: MOT Academic Fieldwork Coordinator Michelle Massey, MS, OTR/L (2nd row, far left), with MOT students. 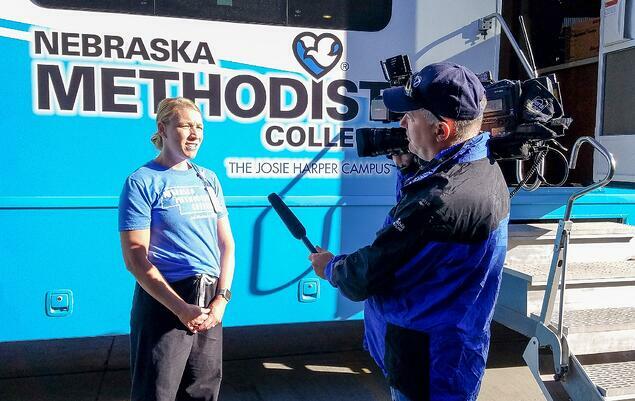 Below: KETV interviews Dr. Jillian Sisson. Suburban Rotary of Omaha, chartered in 1967, is one of Rotary International’s 32,000 service clubs. The purpose of the organization is to bring together business and professional leaders to provide humanitarian service, encourage high ethical standards in all vocations, and help build goodwill and peace in the world. The stated purpose of the organization is to bring together business and professional leaders to provide humanitarian service, encourage high ethical standards in all vocations, and help build goodwill and peace in the world. Open Door Mission is a Gospel Rescue Mission founded in 1954 committed to breaking the cycle of homelessness and poverty. Each day, Open Door Mission’s campus offers 816 safe, shelter beds to homeless men, women, and children, serves over 2,100 hot, nutritious meals, and provides preventive measures to more than 1,082 people living in poverty.